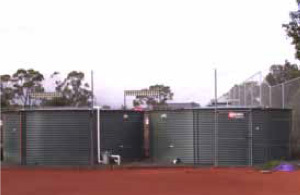 Water restrictions are in force and the Club has invested heavily in court treatments, water storage and reticulation systems to ensure our courts can be maintained at a very high standard. We have the best courts in the area and want to keep them in excellent condition. But every member has a role to play. On hot and windy days extra watering time is necessary to prevent the surface blowing away. The last member to leave the courts must ensure that all gates are securely locked. Correct footwear for porous courts has a tread pattern giving reasonable grip and player safety without causing damage to the playing surface. Shoes that have large tread patterns, sharp angular edges or shoes with heels are not suitable for porous courts as they cut into the court surface. Shoes that are suitable for hard surfaces such as Plexipave are not ideal for porous courts. A good test to know if your shoe is suitable for porous courts is to rub your hand across the sole of the shoe. 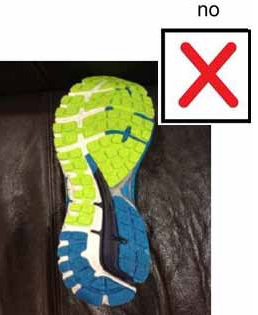 If the sole feels rough, then it will not be suitable. On the other hand, shoes with little to no tread may also be unsuitable as they are prone to excessive slipping and can be dangerous. PLEASE ENSURE YOU ARE WEARING THE CORRECT FOOTWEAR ON OUR COURTS TO ENSURE SAFETY AND TO MAINTAIN OUR EXCELLENT PLAYING SURFACE. The only acceptable outersole for porous courts is a herringbone pattern which is usually found on tennis-specific shoes and selected cross trainers from brands such as K-Swiss, Adidas, Brooks and New Balance. 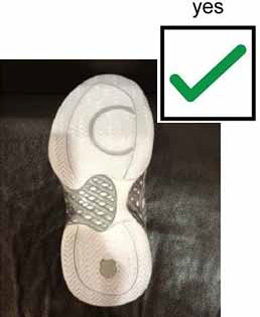 Any shoe outersole which has a lugged pattern is unacceptable on porous courts as it will chew up and leave marks across the surface resulting in serious damage and costly maintenance.